The focus of the concept is to take the current introverted space and open it to the surrounding streets and the urban neighborhood, creating a more interactive and spontaneous experience that connects to the existing fabric of downtown Phoenix. 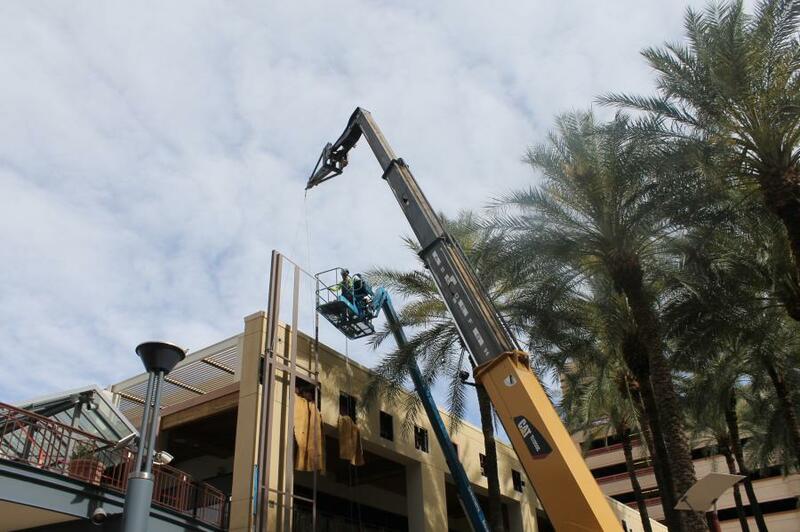 Contractors are at work on a $25 million project that will completely renovate the iconic Arizona Center and pave the way for additional future projects, including a boutique hotel and multi-family housing. 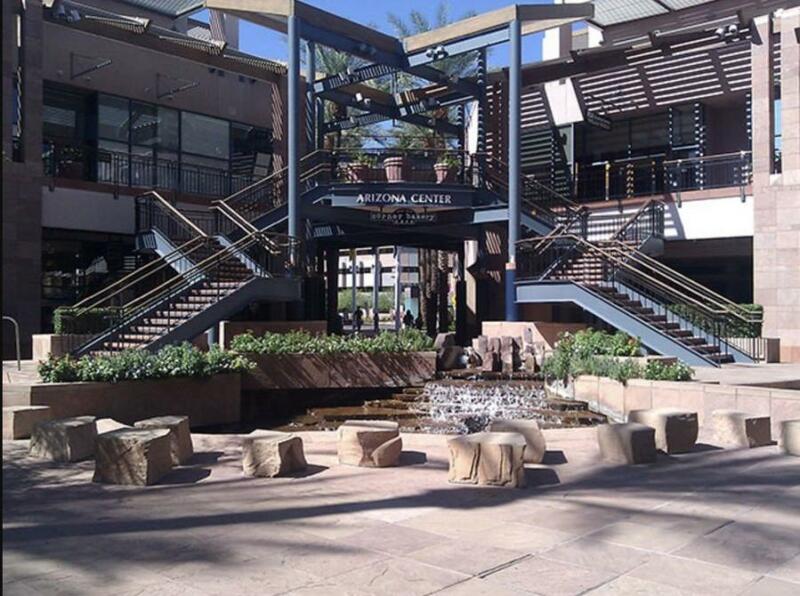 Located in Phoenix, the Arizona Center was built in 1990. Parallel Capital Partners purchased the 36-acre property in 2015, paying $126 million for the center with entitlements for an additional 3.9 million sq. ft. of improvements. 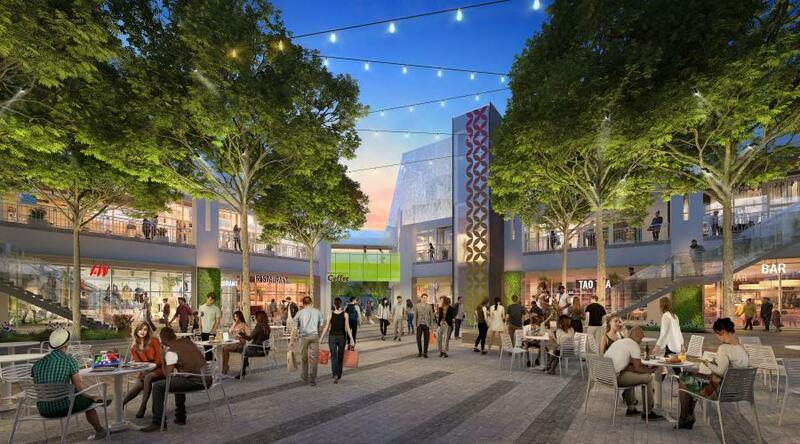 Skanska USA will manage the construction project with Gensler partnering as architect. The focus of the concept is to take the current introverted space and open it to the surrounding streets and the urban neighborhood, creating a more interactive and spontaneous experience that connects to the existing fabric of downtown Phoenix, said Mike Jackson, project manager of Parallel. The character of the place will be quite different, Jackson said. The entire storefront is being replaced and the tenant mix is expected to shift from the original one-third restaurant/two-third retail to closer to 80 percent restaurant and 20 percent ancillary. Another interesting aspect of the project is the way contractors are renovating the façade, Jackson said. Rather than tear it out, workers will punch holes in the plaster to get to the steel columns and beams behind it to attach a metal iron grid that will go outboard of that. 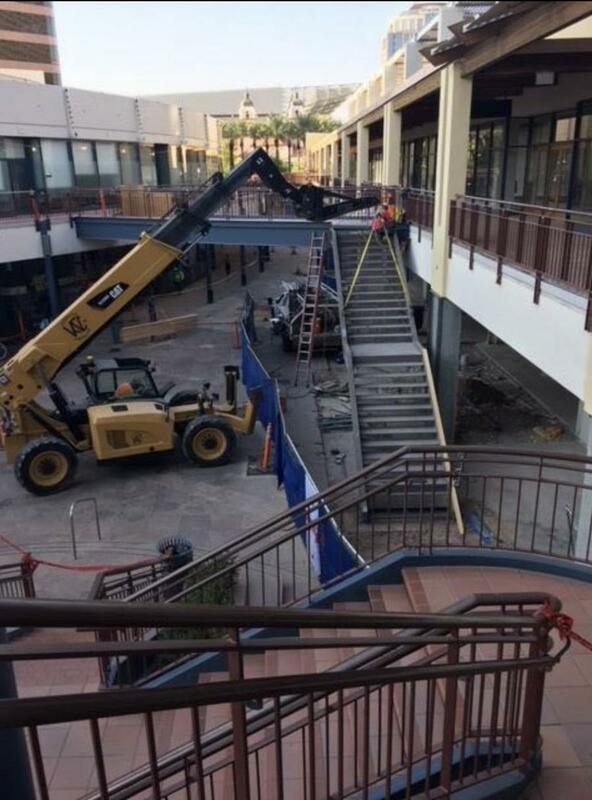 They've also pulled out a “huge” staircase, and are replacing a pair of escalators at each end of the mall with three glass backed elevators that will be positioned so they do not hamper circulation or view corridors, but still provide a “terrific” ability to travel up and down. All of the exterior lighting will be replaced and the wood soffits are being refinished. Heavy equipment on the site includes a small crane and numerous boom lifts to help workers reach areas in higher places. 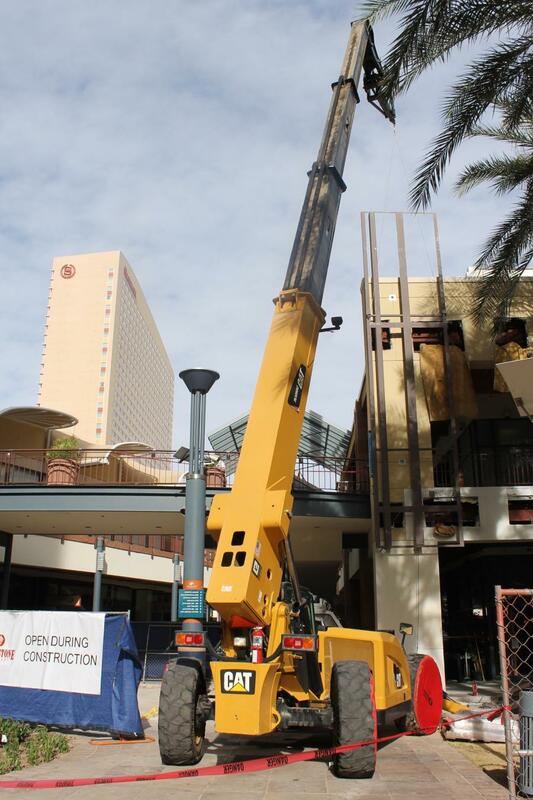 A large crane will be brought in to add yet another finishing touch to the center. “We will be putting in 30-60-foot box trees that will have to be craned in because they are so large,” Jackson said. One of the biggest challenges of the project is completing the work with tenants still occupying the building, Jackson said. Work on the retail portion of the project is scheduled for early 2018. In the office tower, Parallel is replacing all the elevators, including those in the parking garage, and will build a new lobby, new gym training center, executive conference rooms and specialty suites. Other than it will include a 31-story tower, Parallel isn't ready to go into detail about plans for the boutique hotel and high-rise apartment building, but did say it is expected to be complete in about five years. “Downtown Phoenix is really having a bit of a renaissance,” Jackson said. “The Arizona Center was not physically in the center of things when it was first built, but it is almost the center now. The Convention Center sits to the south of us. There are four apartment buildings just to the north. The Sheridan Hotel is to the west, and T-Gen — a genomics research center — is to the east. 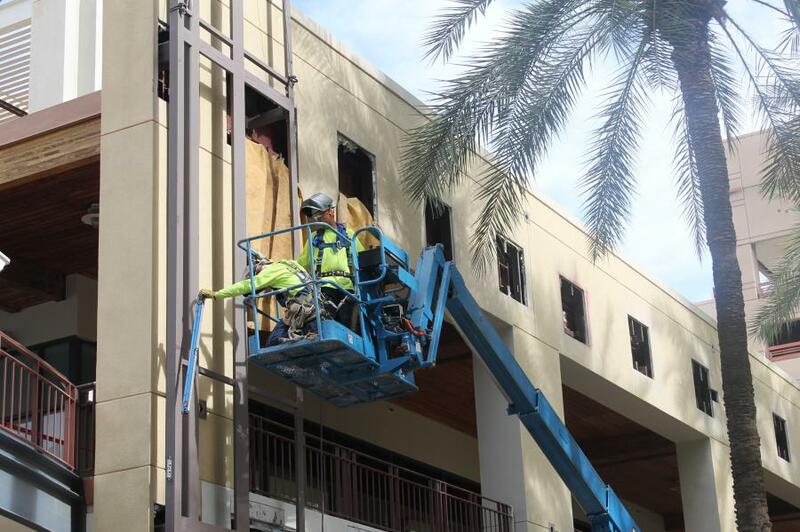 To read a previous story about the Arizona Center, see Iconic Arizona Center Begins Construction on $25M Renovation.